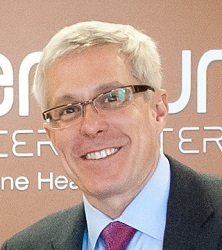 Barry Blyton, MD, is the Radiation Oncologist caring for our patients. Dr. Blyton plans and oversees the entire treatment process. His primary focus is providing patients with an environment that is conducive to optimal patient recovery. Dr. Blyton has been practicing as a Radiation Oncologist for over 18 years. He completed his undergraduate studies at Indiana University, with a double major in Chemistry and Biology. He received his medical degree from the Indiana University School of Medicine, where he served two years as class president and also received the Dean’s Award for Service. Dr. Blyton completed his internship at St. Vincent Hospital and Health Center in Indianapolis. He completed his Radiation Oncology Residency at Indiana University Medical Center, where he served as Chief Resident. Dr. Blyton is a member of several professional organizations, including the American Medical Association (AMA), the American Society for Therapeutic Radiology and Oncology (ASTRO) and the American College of Radiology (ACR). He has held numerous medical offices, and is an ardent patient advocate, speaking frequently on topics related to cancer and radiation oncology. Dr. Blyton is Board Certified in Radiation Oncology by the American Board of Radiology.